Preheat oven to 400 degrees. Grease a muffin pan. Sift together flour, sugar, baking powder, cinnamon, ginger, nutmeg, and salt. Cut in butter with two knives or a pastry blender until it is fully incorporated. In a separate bowl, mix pumpkin puree, evaporated milk, egg, and vanilla. Pour pumpkin mixture into the flour mixture. Add raisins. Fold gently until mixture is just combined. Spoon into muffin pan, filling sections one-half full. 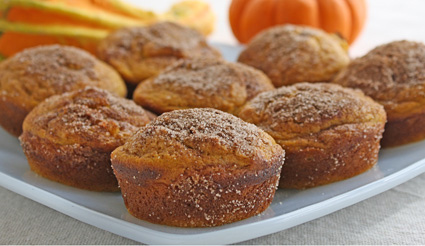 Sprinkle the top of each unbaked muffin with the cinnamon-sugar-nutmeg mix. Bake for 20 -25 minutes. Allow muffins to cool in pan for 15 minutes before removing. Enjoy! My Mom loves this broccoli casserole. She requested that I bring it to her birthday luncheon this coming weekend. It's also an easy family favorite for holiday gatherings. Broccoli and rice in a flavorful cheese sauce...num num! Cook broccoli according to package directions until tender. Drain. In a large bowl, combine instant rice, milk, soup and chopped onion. 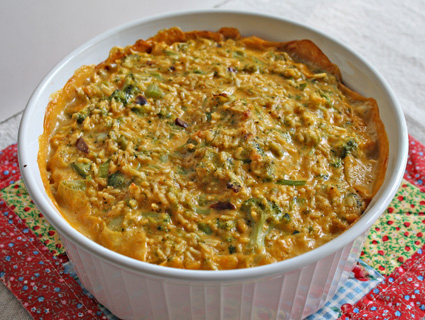 Stir in broccoli and processed cheese sauce. Mix thoroughly. Pour into a 13" by 9" baking dish. Bake at 350 degrees for 25 to 35 minutes, until bubbly on top. I had a box of beef Rice-A-Roni on the shelf so I thought I'd give this recipe a try. 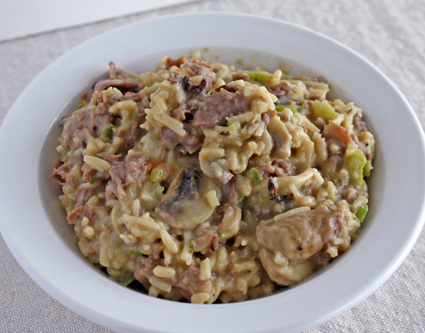 I went to Rice-A-Roni's website; they have quite a few good-lookin recipes to make with Rice-A-Roni and Pasta-Roni mixes. One thing that caught my eye about this recipe is one of the ingredients is a pre-cooked meat, deli roast beef. In a large skillet, combine rice-vermicelli mix and 2 tablespoons of margarine. Slowly stir in 2 1/2 cups water and Special Seasonings packet; bring to a boil. Cover and reduce heat. Simmer 12 minutes. Stir in mushrooms, onion, bell pepper and garlic. Return to a simmer. Cover and simmer 5 to 7 minutes or until vegetables are crisp-tender. Add beef; cook and stir until heated through. Remove from heat; stir in sour cream and parsley. Serve. Getting tomato paste out of the can be difficult; having to patiently scoop out the thick paste. Here's a solution: Open both ends of the can with the can opener. Carefully push the tomato paste from one end of the can to the other until it comes out whole. Much easier than digging it out with a spoon! I've been making this easy cake with pudding recipe since the '70s. 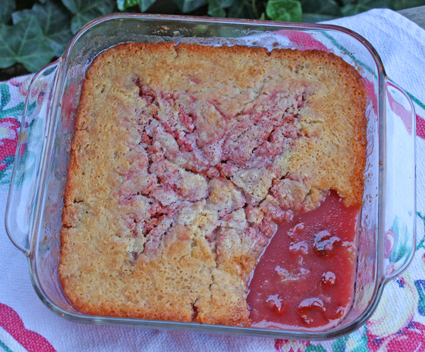 The moist vanilla cake combined with red cherries in a sweet cherry sauce is down-home goodness! The kids will have fun "dumping" the ingredients into the pan. Melt butter or margarine. Pour into a 9 in x 9 in baking pan. In a medium size bowl, mix together 1 cup of the sugar, flour, and baking powder. Add the milk and vanilla blending well to make a cake batter. Pour the batter into the pan over the melted butter. Do not stir. Open the canned cherries. Pour juice and all on top of the cake batter. Do not stir. Sprinkle the remaining 1/2 cup of sugar evenly over the top of the cherries. Again, do not stir. Bake at 325 degrees for 50-60 mins. Enjoy! Ethylene gas; hmmm...sounds like a new type of fuel found at the local convenience store doesn't it? Nope, it's a gas emitted by certain fruits and vegetables as they ripen. Produce such as carrots and kiwi fruit are sensitive to this gas and will quickly spoil and decay if exposed. 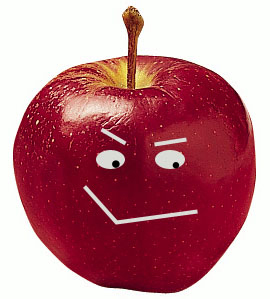 The Perpetrators- these create ethylene gas: Apples, apricots, avocados, bananas, blueberries, cantaloupe, some citrus fruits, cranberries, figs, guavas, grapes, green onions, honeydew melon, ripe kiwi fruit, mangoes, mushrooms, nectarines, okra, papayas, passion fruit, peaches, pears, peppers, persimmons, pineapple, plantains, plums, prunes, quinces, tomatoes and watermelon. The Victims- these do not like ethylene gas: Asparagus, broccoli, Brussels sprouts, cabbage, carrots, cauliflower, chard, cucumbers, eggplant, green beans, kale, kiwi fruit, leafy greens, lettuce, parsley, peas, peppers, potatoes, romaine lettuce, spinach, squash, sweet potatoes, watercress and yams. Bacon and cheese are two of my favorite things in life and since bacon was on sale this week, I just had to make something with it. Wha la! 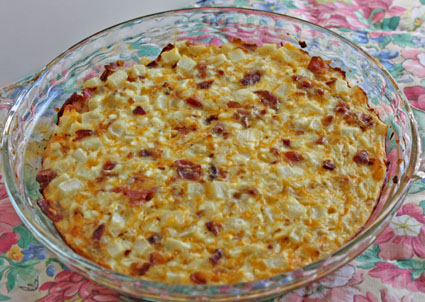 Amish Breakfast Casserole. This casserole is hearty and satisfying due to the hash browns and 3 kinds of cheese. It smells lovely baking in the oven. The bacon, onion, and eggs give it that "special breakfast" flavor. Variations: If you’re an egg lover, add an extra egg. This recipe also works great with crumbled breakfast sausage. In a large skillet cook bacon and onion until bacon is crisp; drain. In a large bowl, slightly beat the eggs. Mix in the hash browns, 3 cheeses, and pepper; fold in the bacon and onion mixture. Spread in a greased 13-in. x 9-in. baking dish. Bake, uncovered, at 350° for 35-40 minutes or until a knife inserted near the center comes out clean. Let stand for 10 minutes before cutting. Yield: 12 servings.